Thane is a splendid city which is urbanizing at a great speed. Second, to Mumbai, this city is constantly growing in prominence attracting many entrepreneurs and business to explore their avenues over here. In addition, with a plethora of opportunity in terms of work and housing offered, the crowd from other places are moving on to Thane in great numbers. The crowd is modern and so are their needs. Whether its the lifestyle or the houses one lives in. The booming real estate calls out for wonderful interiors too. And here is where Delecon Design Company marks our entry. With their exotic ideas and marvelous craftsmanship, we at Delecon Designs have offered interior works that are a treat to the onlookers. Our services are not limited to a single niche alone. The services range from offers interior design solutions to Residences, Commercial Outlets, as well as Offices. With years of expertise in the field, the company has grown on to mark their presence in the interior designing market, counted among the top 10 Interior Designers in Thane in the field. Backed by a proficient team of designers, craftsmen we are set on the mission of transforming lives and fine-tuning the living conditions with their state of art ideas. We at Delecon Design Company offer an arena of services that is indigenous to each niche. In the coming paragraphs we will take you through our offerings with a view to render a comprehensive understanding of the same. The real estate boom has led to a lot of housing complexes and societies coming up in Thane. Considering the lifestyle of the people living here, the wish no less than the best. This is no different for their houses too. With our sheer dedication, ideation and a wonderful team of professionals we have earned the epithet of the most sought Best Residential Interior Designers in Thane. We have a myriad of projects to pride for in our kitty. Solely with good ideas, we have transformed the entire interior of various residences and given it an uplifted look. Our team comprises of some of the top designers and smart workers who hold professional expertise about every aspect of interiors who know which color combination suits best, what kind of furniture and lighting can make the room look bigger, etc. Additionally, we also help in configuring the house based on Vaastu tips. Isn’t that now a cherry on the Cake? 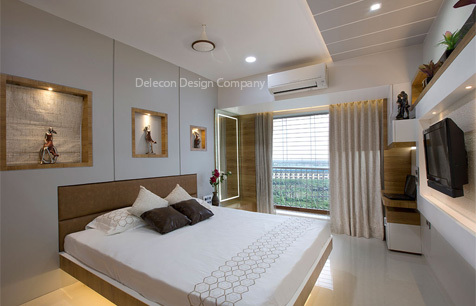 As interior designers, we have not only proven our mantle as best residential designers but have also showcased our caliber as one of the most popular Commercial Interior Designers in Thane. Our team is extremely organized who follow a systematic working style followed by periodic supervision and maintenance work, which makes it its top USP. Knowing the very essence of the place, the team of designers is able to grasp the requirement thereby rendering an output that’s in tandem to the client’s need. Every Office speaks for its own. The very interiors aid in forming the first impression. We are renowned for our dexterity as popular Office Interior Designers in Thane, who have aided many businesses to transform the entire outlook of their workspace. With proficient ideation, we have aided in making optimum use of the space and yet make it look spacious and airy. From using the perfect color scheme for example – colorful and vibrant colors for companies into media, advertising to sober whites for businesses dealing in education and pharma, we aim at putting across their best foot forward without any room for complaints. Delecon Designs are known for thinking from the client’s viewpoint and thereby offering them the exact output they dreamt for. Customer Satisfaction is of paramount importance to us and we deem to offer the best in aspects of quality, output and workmanship.